Elite Sit-Stand Arm with Laptop Tray | ICWUSA.com Inc.
Be more comfortable using your laptop computer and have your choice of sitting or standing. 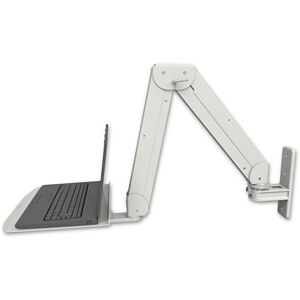 This is a height-adjustable arm with a laptop tray that improves ergonomics and can help relieve neck and back strain. The Elite 5520 Mount with a Laptop Tray raises and lowers 42″ (106.7 cm), reaches up to 65″ (165 cm) and has 180° of horizontal movement–enabling you to position your laptop computer where it’s most comfortable for you to work. This arm is easy to adjust, effortless to use, and stows away compactly. It works with any notebook computer and can mount to a wall, wall track, pole, or desk. The Double Arm Elite mount with a Laptop Tray is counter-balanced, making it effortless to move in any direction. Internal cable management creates a neater appearance, protects wires and simplifies cleaning. Adjustable rotation stops protect the equipment and facility from damage. Machined from strong billet aluminum, the unit is powder coated for a durable, lasting finish. ICW computer mounts are designed, engineered, manufactured and hand-assembled with complete attention to detail. The Elite arm with Laptop Tray will provide years of dependable service. The Double Arm Elite mount with a Laptop Tray provides up to 42″ (106.7 cm) of vertical adjustment, making it a true sit-stand workstation. The laptop mounting arm reaches 65″ (165 cm) horizontally and stows compactly 11″ (28 cm) from the wall. The arm mounts to the wall in a narrow footprint of just 3″. The laptop tray swivels 360°. The Double Arm Elite mount with a Laptop Tray is machined out of billet aluminum for strength and durability.